To Cite: Taghavi S N, Kamani H, Dehghani M H, Nabizadeh R, Afshari N, et al. Assessment of Heavy Metals in Street Dusts of Tehran Using Enrichment Factor and Geo-Accumulation Index, Health Scope. Online ahead of Print ; 8(1):e57879. doi: 10.5812/jhealthscope.57879. Street dust contains small matters coming from motor combustion and other anthropogenic sources. These elements are known as indicators of heavy metals, which have an important role in environmental pollution. The purpose of this study is to evaluate the degrees of arsenic, cadmium, copper, lead, and zinc pollution in street dust by using of the geo-accumulation index and enrichment factor. For sampling, 35 points are randomly defined by using the geographic information system. The metals were detected using acid digestion inductively coupled plasma optical emission spectrometry. The order of geo-accumulation index of analyzed heavy metals were: arsenic < lead < cadmium < zinc < copper. The copper levels can be considered as “moderately to heavily polluted” status. The assessment results of enrichment factor and geo-accumulation index showed that Arsenic did not have any noticeable concern, while enrichment factor of lead and zinc had moderate enrichment, and cadmium and copper had moderately severe enrichment. The average levels of studied metals were higher than the mentioned background level. There are variant elements causing high levels of heavy metals in street dust of Tehran. For instance, the extensive traffic following by the vehicles speed and braking, power plants, and industrial emissions are the main factors. Therefore, considering this information as an alarming sign for the safety of our environment is needed. Daily developing industries, increasingly expanding cities, increasing population, and human activities lead to an increase in resource and energy consumption. Highly human activities deteriorate environments including heavy-metal pollution. Recently, urban soil contaminated with heavy metals has been focused upon in order to avoid environment deterioration. Some correction experiments have been done on these fields. Heavy elements are potent traces of human activities (1-4). According to the fact that heavy metals are among the most significant and well-known pollutants, their penetration into the environment leads to various damages and diseases. The mentioned elements are toxic and harmful to some creatures, including humans. However, their consumption and also production in some industries are inevitable (5). The heavy metals originated from resources penetrating the environment, such as soil, water, sedimentation, and ecosystem. The main resources for production, distribution, and propagation of heavy metals include household activities, agriculture wastes, industrial emissions (such as power plants, fossil fuel burning, metallurgy industry, and chemical factories), and traffic emission (particles emitted due to asphalt corrosion, route equipment’s, route maintenance equipment’s, vehicle tire, as well as gas emitted from motor vehicles and other machineries) (6-11). In conclusion, combustion process leads to distribution of VOC, NOx, CO, and particulate matter. Toxic particulate matters emitted from vehicles are of the high concern in terms of human health (4). Therefore, motor vehicle emissions are among the most important heavy metal resources in urban environments. Traffic leads to serious problems, especially in highly populated cities (12). Studies have shown that an increase in dust, as an air pollution index in urban regions and heavy metals embedded in atmosphere sedimentations (due to accumulation of solid particles on the ground), are used to provide useful information on pollution levels of urban regions, which can be an average measure for urban environment quality (13-15). Additionally, sediments on the streets can be carried over by wastewater, which is one of the most important contamination resources (16). Therefore, it is necessary to explore the origin of production and distribution of heavy metals propagated in urban environments (17). This study is aimed at evaluating the pollution level of heavy metals (arsenic (As), cadmium (Cd), copper (Cu), lead (Pb), and zinc (Zn)) as well as identifying the natural and human-made pollution resources affecting the pollutants concentration distributed around Tehran. To evaluate the pollution level of samples, geo-accumulation index (Igeo) and enrichment factor (EF) are calculated. Tehran is of 51 to 53 east longitude and of 35 to 36 north latitude. From the south, Tehran is surrounded by west-north boundary of central and it goes to the south part of Alborz Mountain from the north. The east part of Tehran is surrounded by Jajrood and the west part of it attaches to Karaj (18). Tehran has an area of 750 km, including 22 districts (19), and its population is 8293140 based on statistics published in 2011 (20). A total of 35 street dust samples randomly defined in geographic information systems (GIS) were collected in June 2016, in Tehran (Figure 1). To collect the samples, a plastic brush and a scoop were used. By applying the global positioning system (GPS), the longitude and latitude of the sampling site has been determined. At each sample site, approximately 500 g of dust sample was collected by sweeping. Next, they were dried in an oven at 60˚C for 24 hours in order to prevent the loss of possible volatile metallic compounds. After drying, samples were passed through a stainless steel sieve of 0.149 mm (100 mesh) to remove sands, coarse particles, and other fragments. A total of 1 g of each sample was transferred into a glass Pyrex beaker (21). Samples were digested with HNO3, HCL, and H2O2 (purchased from Merck Company, Germany) using the USEPA 3050B method (22); then, digested solutions were filtered through a 0.2 µ filter. Metal concentrations of As, Cd, Cu, Pb, and Zn, in the digestion solution, were determined using inductively coupled plasma optical emission spectrometry (ICP-OES) (Spectro Arcos Model, Cleve, Germany). Blank, standard, and duplicated samples were simultaneously performed in two analyses as quality control. Statistical analysis issued in the current study includes descriptive statistics and evaluation of data normality using SPSS 21. Additionally, Origin Lab 9.2 is used to draw box figures of metal pollution indices. The pollution levels of heavy metals were found applying EF and Igeo, which are commonly used to assess the pollution levels of metals in soil (23-25) sediment (26-28) and dust (17, 29, 30). Igeo and EF can be employed to study the pollution status (23). When using EF and Igeo, choosing proper background levels is an essential effect. In literature, the background values can be assessed based on average values or the average crustal abundance data. However, these data are likely to be overall and might be misinformed in a specific study area; the local background values could be more suitable (31) (Table 1). where Cn is the content of measured metal, n the specified sample, Bn is the geochemical background content of the metal n (33-35) (natural value of the metal in the nearby soil without human affect is used to compensate possible variations of data because of lactogenic effects) (36). The coefficient 1.5 is introduced to minimize the fluctuations in the background values (37, 38). The geo-accumulation index includes seven classes (39) (Table 2). Class six is an open class and consists of all values higher than grade five. The elemental pollution in grade six may be hundred folds greater than the background value (40). In order to quantify the degree of heavy metal pollution, the EF was determined on the standardization of a measured metal. A reference metal is usually characterized by low existence variability, such as elements: aluminum, iron, titanium, silicon, strontium, potassium, etc. (17, 29, 41-43). where (CiCref)Sample and (CiCref)Background refer to the concentration ratios of an objective metal as well as the reference metal in the street dust samples and in the background material, respectively (21, 46). Therefore, each sample falls into one of the seven grades (Table 2) (47). Statistical features of metal concentrations of dusts dispersed in the under-study area and background values are given in Table 1. Heavy metal concentrations are 1.92 to 9.78 mg/kg dust for As (with the mean of 5.63), 0.05 to 8.85 for Cd (with the mean of 0.92), 48.97 to 518.84 for Cu (with the mean of 182.59), 24.99 to 249.57 for Pb (with the mean of 110.27), and 79.51 to 615.02 for Zn (with the mean of 370.97). Additionally, coefficient of variation (C.V = standard deviation/mean) follows the following order: CVAs (0.24), CVCu (0.41), CVZn (0.42), CVPb (0.48), and CVCd (1.79). The results of Kolmogorov-Smirnov test shows that the concentration of arsenic, copper, lead, and zinc follows the normal distribution function while cadmium does not follow the mentioned function, which normalized using data natural logarithm. The calculated results of Igeo of heavy metals in dust collected from street dust of Tehran and are presented in Table 4. The Igeo ranges from, -2.40 to 0.54 (average of -0.45) for As, -1.88 to 5.52 (average of 1.49) for Cd, 0.25 to 3.66 (average of 2.05) for Cu, -0.754 to 2.58 (average of 1.24) for Pb, and -0.41 to 2.54 (average of 1.74) for Zn, respectively. The average degrees of Igeo (Figure 2) decreases in the order of CAs < CPb < CCd < CZn < CCu. The results of EF of heavy metals in the study are showed in Table 5. The EF ranges from 0.23 to 1.80 (average of 1.01) for As, 0.36 to 60.00 (average of 6.24) for Cd, 1.56 to 16.54 (average of 5.82) for Cu, 0.78 to 7.81 (average of 3.45) for Pb, and 0.99 to 7.75 (average of 4.83) for Zn, respectively. According to Table 1, the minimum concentration of Cu is 48.97 mg/kg related to sediments (sample 1) of Chamran highway and the Gisha Bridge; the maximum value is 518.84 mg/kg, which is founded at Shariati Street (sample 4). It can be said that significant reduction in Cu concentration is due to the construction of multilevel junction and lack of traffic on Chamran Highway. Due to heavy traffic and frequent use of brakes, Cu concentration increases (30). The minimum concentration of Pb is 24.99 mg/kg, which is related to the Chamran Highway for specific times and days of the weak due to light traffics. The maximum concentration of Pb is 285.89 mg/kg, which is related to Enghelab Street crossing Vesal Street (sample 2) showing serious problems comparing to mean concentration of mantle elements. Enghelab is one of the main streets of Tehran loaded with a high amount of Pb due to heavy traffic and high speed of motor vehicles. The minimum concentration of Zn is 79.51 mg/kg, which is related to the Chamran Highway and the maximum value is 647.41 mg/kg, which is related to Fisrt Sadeghie, Kashani Street (sample 30). According to the fact that tire friction produces high amounts of zinc, the mentioned street is heavily loaded with Zn, which is due to heavy traffic, traffic light, and frequent use of brakes. In comparison with heavy metal concentration calculated in other cities (Table 3), cadmium, copper, zinc, and lead are of the highest concentrations leading to serious problems. In comparison between metal concentration and background value concentrations (Table 1), it is shown that the under-study area is heavily polluted. The high amount of these pollutants originates from other resources than natural ones. One possible resource can be fossil fuels used for motor vehicles in Tehran, which leads to more serious problems in Tehran due to low quality. Vehicle corrosion, metal equipment’s around the city and particles emitted from tires and brakes are among other unnatural resources. In comparison to other cities, especially developed ones, Tehran suffers from higher amounts of cadmium, copper, lead, and zinc. Copper and zinc are of the highest concentration. In worldwide comparison, cadmium and lead, as the primary pollutants, are of high concentration except in some parts. Although Iran is not considered as an industrial country compared to such countries as Spain, Canada, and England, high amounts of pollutants cause serious problems. Compared to studies conducted in Shiraz, cadmium, copper, and lead are of significantly high concentration. The Igeo values of 40% in As dust samples are less than zero, which shows that the mean Igeo As in the dust of Tehran streets is not polluted. The Igeo values 34% Igeo of Cd, 43% Igeo of Pb, and 60 % Igeo of As; between zero and one none to moderate pollution is revealed. The mean values of Igeo for Pb, Cd, and Zn, and 37% Igeo of Pb, 43% Igeo of Cd, and 48% Igeo of Zn, which were between one and two revealing moderately polluted, while 11% Igeo of Cd, 17% Igeo of Pb, and 46% Igeo of Zn, between two and three reveals moderately severe pollution. The mean Igeo was obtained for Cu points to moderately severe polluted. Percentage Igeo of Cu mainly falls into class three (1 < Igeo ≤ 2, 28 %) and class four (2 < Igeo ≤ 3, 63 %) showing that Cu is moderately polluted and moderately severe polluted in dust. Table 4 shows Zn, Pb, Cu, and Cd pollution in different levels of dust samples collected from Tehran streets. Results of geo-accumulation index, which were based on the average value for qualifying the heavy metal pollution, showed a minor pollution. Only a small amount of contamination related to Cd and Cu as well as Pb and Zn were found. Arsenic showed no trace in samples. The EF values of As in 66% dust samples is < 1 in dust street of Tehran are no enrichment. The mean values of EF for As, and 26% EF of Cd, 34% EF of As, and 37% EF of Pb were between one and three, which reveals minor enrichment. The mean values of EF for Pb and Zn were between three and five, while the EF values 37% EF of Cu, 48% EF of Pb, 54% EF of Cd, and 65% EF of Zn revealing moderate enrichment. The mean EF for Cu and Cd, and 8% EF of Cd, 12% EF of Pb, and 32% EF of Zn, and 57% EF of Cu were between five and ten, showing moderately severe enrichment. The contamination results assessment of EF is consistent with those of Igeo. According to EF, it is possible to compare the amount of an element and its natural concentration (52). EF discriminates natural and human resources (46). According to studies on EF, if EF is < 1 the element has the natural origin and if EF is > 1 the human origin is proved (53, 54). Based on Figure 3, we have 1 ≤ EF for arsenic, 3 ≤ EF for zinc and copper, and 5 ≤ EF for cadmium and copper. Cadmium, copper, lead, and zinc are really harmful to the human health in contact with sediments of the studied area. Geomorphological features of the area are of high effect. Figure 3. Boxplot of enrichment factor for heavy metals in street dust from Tehran. No enrichment (EF ≤ 1); minor enrichment (1 < EF ≤ 3); moderate enrichment (3 < EF ≤ 5), moderately severe enrichment (5 < EF ≤ 10), severe enrichment (10 < EF ≤ 25), very severe enrichment (25 < EF ≤ 50), and extremely severe enrichment (EF > 50). According to wild nick classification, soil parameters with the CV of more than 35% are categorized as highly changing variables (55). The comparison of metal CVs indicates that cadmium is the highest changing metal and arsenic is the lowest changing one. To identify the origin of metals, Guo et al., concluded that metal under the effect of human activities are of higher CV (56). They showed that elements with CV < 0.4 are of the natural origin and elements with CV > 0.4 are human-based (57). Based on EF results, it is concluded that cadmium, copper, lead, and zinc are of the human-based resources (vehicle components and building ingredients) and arsenic is of the natural origin. According to the fact that street sediments easily spread and enter the breathing system, heavy metals has to be focused on. Results have indicated that high amounts of lead are included in dust and street sediments. According to EF and Igeo, cadmium and copper concentrations are seriously threatening in Tehran. Results also show that heavy pollution of central parts of Tehran is due to human activities. Studies have shown that there is direct relationship between human activities and heavy metal pollution due to metal accumulation. The authors would like to thank the School of Public Health, Tehran University of Medical Science for financial support of this study. Conflict of Interests: No conflict of interest. Funding/Support: The School of Public Health, Tehran University of Medical Science. 1. Nabizadeh R, Mahvi A, Mardani G, Yunesian M. Study of heavy metals in urban runoff. Int J Env Sci Tech. 2013;1(4):325-33. doi: 10.1007/bf03325849. 2. Yang J, Chen L, Liu LZ, Shi WL, Meng XZ. Comprehensive risk assessment of heavy metals in lake sediment from public parks in Shanghai. Ecotoxicol Environ Saf. 2014;102:129-35. doi: 10.1016/j.ecoenv.2014.01.010. [PubMed: 24530728]. 3. Shahbazi A, Soffianian AR, Mirghaffari N, Einghalaei M. Contamination factor and comprehensive pollution index (a case study in Nahavand city). Environ Dev J. 2012;3(5):31-8. 4. Afrifa CG, Ofosu FG, Bamford SA, Wordson DA, Atiemo SM, Aboh IJK, et al. Heavy metal contamination in surface soil dust at selected fuel filling stations in Accra, Ghana. Am J Sci Ind Res. 2013;4(4):404-13. doi: 10.5251/ajsir.2013.4.4.404.413. 5. Ilemobayo O, Kolad I. Profile of heavy metals from automobile workshops in Akure, Nigeria. J Env Sci Tech. 2008;1(1):19-26. doi: 10.3923/jest.2008.19.26. 6. Xie K. Determination of heavy metal contents in soil and plants around an urban environment and rural area [dissertation]. United States, Maryland: University of Maryland Eastern Shore; 1998. 7. Akporido SO, Agbaire PO, Ipeaiyeda AR. Effect of steel production on the quality of soil around udu section of Warri river in the vicinity of a steel plant, Nigeria. Asian J Appl Sci. 2014;7(7):552-67. doi: 10.3923/ajaps.2014.552.567. 8. Du Y, Gao B, Zhou H, Ju X, Hao H, Yin S. Health risk assessment of heavy metals in road dusts in urban parks of Beijing, China. Procedia Environ Sci. 2013;18:299-309. doi: 10.1016/j.proenv.2013.04.039. 9. Zheng N, Liu J, Wang Q, Liang Z. Health risk assessment of heavy metal exposure to street dust in the zinc smelting district, Northeast of China. Sci Total Environ. 2010;408(4):726-33. doi: 10.1016/j.scitotenv.2009.10.075. [PubMed: 19926116]. 10. Al-Khashman OA. Determination of metal accumulation in deposited street dusts in Amman, Jordan. Environ Geochem Health. 2007;29(1):1-10. doi: 10.1007/s10653-006-9067-8. [PubMed: 17203368]. 11. 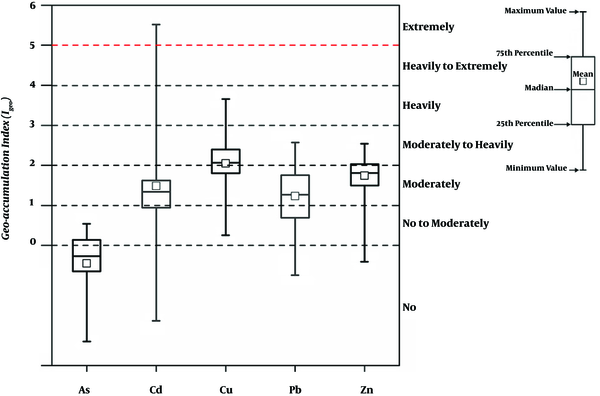 Johansson C, Norman M, Burman L. Road traffic emission factors for heavy metals. Atmos Environ. 2009;43(31):4681-8. doi: 10.1016/j.atmosenv.2008.10.024. 12. Duong TT, Lee BK. Determining contamination level of heavy metals in road dust from busy traffic areas with different characteristics. J Environ Manage. 2011;92(3):554-62. doi: 10.1016/j.jenvman.2010.09.010. [PubMed: 20937547]. 13. Carlosena A, Andrade JM, Prada D. Searching for heavy metals grouping roadside soils as a function of motorized traffic influence. Talanta. 1998;47(3):753-67. [PubMed: 18967380]. 14. Rashed MN. Total and extractable heavy metals in indoor, outdoor and street dust from Aswan city, Egypt. Clean. 2008;36(10-11):850-7. doi: 10.1002/clen.200800062. 15. Keshavarzi B, Tazarvi Z, Rajabzadeh MA, Najmeddin A. Chemical speciation, human health risk assessment and pollution level of selected heavy metals in urban street dust of Shiraz, Iran. Atmos Environ. 2015;119:1-10. doi: 10.1016/j.atmosenv.2015.08.001. 16. Esmaeili A, Moore F, Keshavarzi B, Jaafarzadeh N, Kermani M. A geochemical survey of heavy metals in agricultural and background soils of the Isfahan industrial zone, Iran. Catena. 2014;121:88-98. doi: 10.1016/j.catena.2014.05.003. 17. Al-Khashman OA. Assessment of heavy metals contamination in deposited street dusts in different urbanized areas in the city of Ma’an, Jordan. Environ Earth Sci. 2013;70(6):2603-12. doi: 10.1007/s12665-013-2310-6. 18. Faryadi SH, Taheri SH. Interconnections of urban green spaces and environmental quality of Tehran. Int J Env Res. 2009;3(2):199-208. 19. Shamsipour A, Najibzadeh F, Hossein Poor Z. [Simulation of Tehran air pollution dispersion model in windy air conditions]. Geography Environ Hazard. 2013;1(4):19-36. Persian. 20. Iran SCo. Detailed results of census population and housing tehran: Statistical center of Iran. 2012. Available from: http://www.amar.org.ir/Default.aspx?tabid=1828. 21. Zhang D, Pan X, Lee DJ. Potentially harmful metals and metalloids in the urban street dusts of Taipei City. J Taiwan Institute Chem Engin. 2014;45(4):1727-32. doi: 10.1016/j.jtice.2014.01.003. 22. United States Environmental Protection Agency (US-EPA). USEPA method study 37 SW-846 method 3050 acid digestion of sediments, sludges, and soils. Washington, DC: U.S. Environmental Protection Agency; 1989. 23. Chen H, Teng Y, Lu S, Wang Y, Wang J. Contamination features and health risk of soil heavy metals in China. Sci Total Environ. 2015;512-513:143-53. doi: 10.1016/j.scitotenv.2015.01.025. [PubMed: 25617996]. 24. Chandrasekaran A, Ravisankar R, Harikrishnan N, Satapathy KK, Prasad MV, Kanagasabapathy KV. Multivariate statistical analysis of heavy metal concentration in soils of Yelagiri Hills, Tamilnadu, India--spectroscopical approach. Spectrochim Acta A Mol Biomol Spectrosc. 2015;137:589-600. doi: 10.1016/j.saa.2014.08.093. [PubMed: 25240831]. 25. Vega FA, Covelo EF, Cerqueira B, Andrade ML. Enrichment of marsh soils with heavy metals by effect of anthropic pollution. J Hazard Mater. 2009;170(2-3):1056-63. doi: 10.1016/j.jhazmat.2009.05.074. [PubMed: 19525065]. 26. Aiman U, Mahmood A, Waheed S, Malik RN. Enrichment, geo-accumulation and risk surveillance of toxic metals for different environmental compartments from Mehmood Booti dumping site, Lahore city, Pakistan. Chemosphere. 2016;144:2229-37. doi: 10.1016/j.chemosphere.2015.10.077. [PubMed: 26598991]. 27. Vallejo Toro PP, Vasquez Bedoya LF, Correa ID, Bernal Franco GR, Alcantara-Carrio J, Palacio Baena JA. Impact of terrestrial mining and intensive agriculture in pollution of estuarine surface sediments: Spatial distribution of trace metals in the Gulf of Uraba, Colombia. Mar Pollut Bull. 2016;111(1-2):311-20. doi: 10.1016/j.marpolbul.2016.06.093. [PubMed: 27423441]. 28. Hasan AB, Kabir S, Selim Reza AHM, Nazim Zaman M, Ahsan A, Rashid M. Enrichment factor and geo-accumulation index of trace metals in sediments of the ship breaking area of Sitakund Upazilla (Bhatiary–Kumira), Chittagong, Bangladesh. J Geochem Explor. 2013;125:130-7. doi: 10.1016/j.gexplo.2012.12.002. 29. Chen H, Lu X, Chang Y, Xue W. Heavy metal contamination in dust from kindergartens and elementary schools in Xi’an, China. Environ Earth Sci. 2013;71(6):2701-9. doi: 10.1007/s12665-013-2648-9. 30. Lu X, Wang L, Lei K, Huang J, Zhai Y. Contamination assessment of copper, lead, zinc, manganese and nickel in street dust of Baoji, NW China. J Hazard Mater. 2009;161(2-3):1058-62. doi: 10.1016/j.jhazmat.2008.04.052. [PubMed: 18502044]. 31. Xu X, Cao Z, Zhang Z, Li R, Hu B. Spatial distribution and pollution assessment of heavy metals in the surface sediments of the Bohai and Yellow Seas. Mar Pollut Bull. 2016;110(1):596-602. doi: 10.1016/j.marpolbul.2016.05.079. [PubMed: 27269383]. 32. Wei X, Gao B, Wang P, Zhou H, Lu J. Pollution characteristics and health risk assessment of heavy metals in street dusts from different functional areas in Beijing, China. Ecotoxicol Environ Saf. 2015;112:186-92. doi: 10.1016/j.ecoenv.2014.11.005. [PubMed: 25463870]. 33. Muller G. [Index of geoaccumulation in sediments of the Rhine river]. Geo J. 1969;2:108-18. Japanese. 34. Yu GB, Liu Y, Yu S, Wu SC, Leung AO, Luo XS, et al. Inconsistency and comprehensiveness of risk assessments for heavy metals in urban surface sediments. Chemosphere. 2011;85(6):1080-7. doi: 10.1016/j.chemosphere.2011.07.039. [PubMed: 21862100]. 35. Hanif N, Eqani SAMAS, Ali SM, Cincinelli A, Ali N, Katsoyiannis IA, et al. Geo-accumulation and enrichment of trace metals in sediments and their associated risks in the Chenab river, Pakistan. J Geochem Explor. 2016;165:62-70. doi: 10.1016/j.gexplo.2016.02.006. 36. Martínez LLG, Poleto C. Assessment of diffuse pollution associated with metals in urban sediments using the geoaccumulation index (Igeo). j soil sediment. 2014;14(7):1251-7. doi: 10.1007/s11368-014-0871-y. 37. Masto RE, George J, Rout TK, Ram LC. 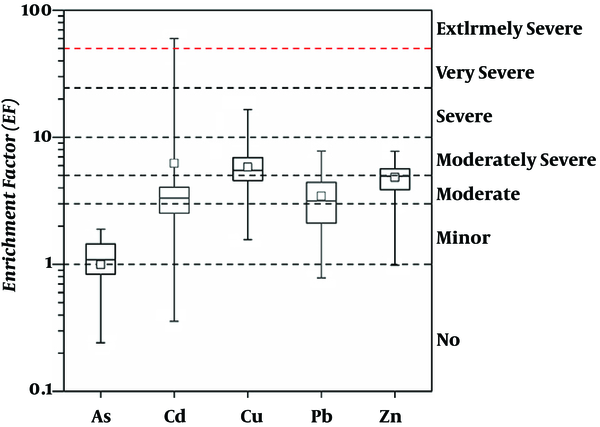 Multi element exposure risk from soil and dust in a coal industrial area. J Geochem Explor. 2017;176:100-7. doi: 10.1016/j.gexplo.2015.12.009. 38. Shi G, Chen Z, Bi C, Li Y, Teng J, Wang L, et al. Comprehensive assessment of toxic metals in urban and suburban street deposited sediments (SDSs) in the biggest metropolitan area of China. Environ Pollut. 2010;158(3):694-703. doi: 10.1016/j.envpol.2009.10.020. [PubMed: 19926184]. 39. Li Z, Feng X, Li G, Bi X, Zhu J, Qin H, et al. Distributions, sources and pollution status of 17 trace metal/metalloids in the street dust of a heavily industrialized city of central China. Environ Pollut. 2013;182:408-16. doi: 10.1016/j.envpol.2013.07.041. [PubMed: 23995021]. 40. Wei B, Jiang F, Li X, Mu S. Spatial distribution and contamination assessment of heavy metals in urban road dusts from Urumqi, NW China. Microchem J. 2009;93(2):147-52. doi: 10.1016/j.microc.2009.06.001. 41. Lu X, Zhang X, Li LY, Chen H. Assessment of metals pollution and health risk in dust from nursery schools in Xi'an, China. Environ Res. 2014;128:27-34. doi: 10.1016/j.envres.2013.11.007. [PubMed: 24407476]. 42. Ghrefat HA, Abu-Rukah Y, Rosen MA. Application of geoaccumulation index and enrichment factor for assessing metal contamination in the sediments of Kafrain Dam, Jordan. Environ Monit Assess. 2011;178(1-4):95-109. doi: 10.1007/s10661-010-1675-1. [PubMed: 20839049]. 43. Abrahim GM, Parker RJ. Assessment of heavy metal enrichment factors and the degree of contamination in marine sediments from Tamaki Estuary, Auckland, New Zealand. Environ Monit Assess. 2008;136(1-3):227-38. doi: 10.1007/s10661-007-9678-2. [PubMed: 17370131]. 44. Wang Y, Yang L, Kong L, Liu E, Wang L, Zhu J. Spatial distribution, ecological risk assessment and source identification for heavy metals in surface sediments from Dongping Lake, Shandong, East China. Catena. 2015;125:200-5. doi: 10.1016/j.catena.2014.10.023. 45. Cevik U, Celik N, Celik A, Damla N, Coskuncelebi K. Radioactivity and heavy metal levels in hazelnut growing in the Eastern Black Sea Region of Turkey. Food Chem Toxicol. 2009;47(9):2351-5. doi: 10.1016/j.fct.2009.06.029. [PubMed: 19549551]. 46. Soltani N, Keshavarzi B, Moore F, Tavakol T, Lahijanzadeh AR, Jaafarzadeh N, et al. 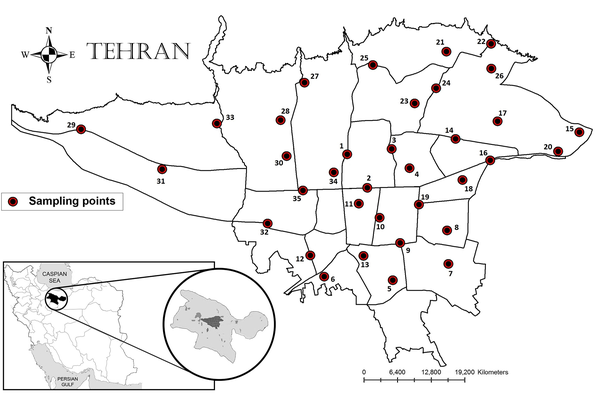 Ecological and human health hazards of heavy metals and polycyclic aromatic hydrocarbons (PAHs) in road dust of Isfahan metropolis, Iran. Sci Total Environ. 2015;505:712-23. doi: 10.1016/j.scitotenv.2014.09.097. [PubMed: 25461074]. 47. Kamani H, Ashrafi SD, Isazadeh S, Jaafari J, Hoseini M, Mostafapour FK, et al. Heavy metal contamination in street dusts with various land uses in Zahedan, Iran. Bull Environ Contam Toxicol. 2015;94(3):382-6. doi: 10.1007/s00128-014-1453-9. [PubMed: 25573278]. 48. Okorie A, Entwistle J, Dean JR. Estimation of daily intake of potentially toxic elements from urban street dust and the role of oral bioaccessibility testing. Chemosphere. 2012;86(5):460-7. doi: 10.1016/j.chemosphere.2011.09.047. [PubMed: 22024094]. 49. Elik A. Heavy metal accumulation in street dust samples in sivas. Commun Soil Sci Plan. 2006;34(1-2):145-56. doi: 10.1081/css-120017422. 50. Ordonez A, Loredo J, De Miguel E, Charlesworth S. Distribution of heavy metals in the street dusts and soils of an industrial city in Northern Spain. Arch Environ Contam Toxicol. 2003;44(2):160-70. doi: 10.1007/s00244-002-2005-6. [PubMed: 12520388]. 51. Rasmussen PE, Subramanian KS, Jessiman BJ. A multi-element profile of housedust in relation to exterior dust and soils in the city of Ottawa, Canada. Sci Total Environ. 2001;267(1-3):125-40. [PubMed: 11286208]. 52. Loska K, Cebula J, Pelczar J, Wiechuła D, Kwapuliński J. Use of enrichment, and contamination factors together with geoaccumulation indexes to evaluate the content of Cd, Cu, and Ni in the Rybnik water reservoir in Poland. Water Air Soil Pollut. 1997;93(1/4):347-65. doi: 10.1023/a:1022121615949. 53. Zhang C. Using multivariate analyses and GIS to identify pollutants and their spatial patterns in urban soils in Galway, Ireland. Environ Pollut. 2006;142(3):501-11. doi: 10.1016/j.envpol.2005.10.028. [PubMed: 16406233]. 54. Yaylalı-Abanuz G. Heavy metal contamination of surface soil around Gebze industrial area, Turkey. Microchem J. 2011;99(1):82-92. doi: 10.1016/j.microc.2011.04.004. 55. Maas S, Scheifler R, Benslama M, Crini N, Lucot E, Brahmia Z, et al. Spatial distribution of heavy metal concentrations in urban, suburban and agricultural soils in a Mediterranean city of Algeria. Environ Pollut. 2010;158(6):2294-301. doi: 10.1016/j.envpol.2010.02.001. [PubMed: 20307922]. 56. Guo G, Wu F, Xie F, Zhang R. Spatial distribution and pollution assessment of heavy metals in urban soils from southwest China. J Environ Sci (China). 2012;24(3):410-8. [PubMed: 22655353]. 57. Yongming H, Peixuan D, Junji C, Posmentier ES. Multivariate analysis of heavy metal contamination in urban dusts of Xi'an, Central China. Sci Total Environ. 2006;355(1-3):176-86. doi: 10.1016/j.scitotenv.2005.02.026. [PubMed: 15885748].